I'll admit it, I'm a creature of habit, especially when it comes to choosing books, if I read an Author and I generally like what they've written, I'll pretty much just keep buying their books... loyal? yes... possibly stupid? maybe, but it works for me. The result is that I usually end up with a library of my favourite Author's works, and I really do get to know their writing style and for better or worse I can tell when they are on good form or not, let's face it we can't be great all the time! So, when Brian Herbert and Kevin J. Anderson released Hellhole, book one of a new sci-fi trilogy, it was out with the wallet and without much thought I had a new addition to my library. Having read their previous collaborations, both the Dune Prelude and Legends of Dune trilogies, I had high expectations of the same kind of fast paced, multiple story line, galaxy spanning space opera, albeit in a different setting. Something along the lines of Kevin J Anderson's excellent stand alone Saga of the Seven Sons series. The original and richest planets, the Crown Jewels, jockey for money, power and position, whilst the Deep Zone planets, the frontier of human colonisation, struggle just for survival far away from the safety of the core planets. 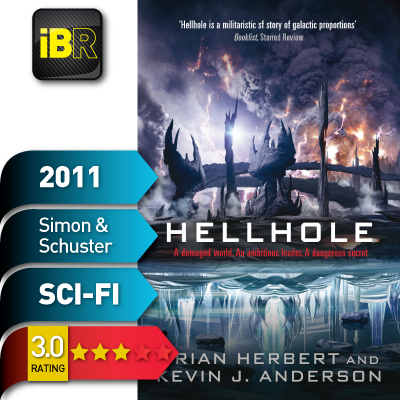 Hellhole, the unofficial Deep Zone capital, which seems as a planet to actively want to kill everyone living on it, is also home to the Xayan, an almost extinct enigmatic Alien race with an ambivalent attitude to the growing. When the whole of the Deep Zone wants to strike out alone, the establishment is hell bent on stopping them and bringing them back under their control, however politics, power plays and a strong case of Alien xenophobia make this less than simple task. So, overall I got what I expected, the story does moves along at a pretty cracking pace, it does have a big cast of Heroes, Villains and Aliens and it does span the galaxy (well, not exactly the galaxy, but certainly a good section of it). So why did I feel a bit let down when I'd finished? Actually, all the points I just ticked off were also the reasons it fell short of a good book in my opinion. They were all there, but they weren't done particularly well. After reading over a dozen books from this team, can I see the formula being put into place one to many times? As much as I like and am fascinated by the "trade craft" of writing, I don't want to actually see it on the page. The story, the characters and the connection I make with them should make the structure kind of invisible, so it's odd to see it show so clearly, especially from such a seasoned team. The very short chapters and quick transitions between story lines never really gave me a chance to get to grips with the story or connect with the characters. It felt like I was constantly being kicked out of the room each time I got switched from one storyline to the other, I'm all for fast paced but do we really need 98 chapters in 500 pages of writing? I got the impression the Authors were using the fast pace to disguise a weakish story. I just didn't feel this book just was built upon the rich and fully imagined backdrops that I had come to expect. The characters and the universe they inhabit all felt a bit light really. Don't misunderstand me, this is a new and unique universe they've created, with some interesting elements, the setting is certainly worthy enough to underpin a good space opera. It's just that we never get time to really come to grips with it and it all feels a bit one dimensional and shallow. The result? Not a bad book as such, it is well written and fast paced, but it just doesn't stand up to previous works by this writing team. Recommendation: For fans of Brain Herbert and Kevin J. Anderson, if you want to read thier best pick any of the others. I will pick up the next book in the series to see if it matures into a stronger story, after all; I am loyal...!